Two teams of students from Birzeit University’s Computer Science, Pharmacy, and Nursing departments have taken the second and fourth places in the 2018 eHealth Summer University competition, held on July 3-5, 2018, in Toulouse, France. Birzeit University took part in the competition with four teams, comprising one computer science major and one doctor of pharmacy or nursing major, who vied with students from Hebron University, the Jordan University of Science and Technology, and the Hashemite University to present the best health informatics project. 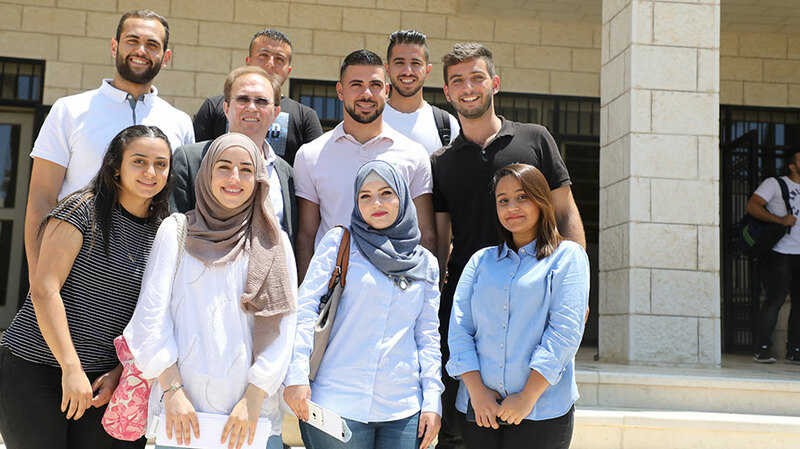 What draws attention to the projects, said Professor of Computer Science at Birzeit University and project supervisor Adel Taweel, is the fact that they stem from the students’ own personal needs and experiences. Out of this heartbreaking experience, Shuqair and Yousef took it upon themselves to help diabetic people care for themselves by building a diabetes companion app that reminds patients of their glucose-level checks, and allows them to maintain constant connection with their physicians and family members for medical emergencies. The other winning team – Moath Mousa and Carmen Mashaala– designed an app to solve a problem that hit them close to home. One of Mousa’s family members had heart valve surgery, and needed to stay in constant coordination with his physician and nutrition specialist, but that proved difficult because of the heart surgeon’s travels. Mousa and Mashaala’s app was designed to establish virtual channels of communication between patients and their physicians, and to allow medical professionals to coordinate and share diagnoses and treatments. Abdullah Jarrar and Nusaiba Owda’s project also aimed to connect patients to physicians as one of its primary goals. The idea for the project sprang to Jarrar’s mind when one of his family members experienced medical issues, and the family began searching for a doctor who would be able to diagnose his illness. The application makes use of user-submitted data to present patients with a map of available physicians and recommendations, and allows them to build a patient file that can be electronically, and securely, sent to the relevant medical professional for a pre-visit diagnosis. The fourth team, made up of Zareefa Shaabna and Muayed Mafarjeh, created an application that serves as the cornerstone for an electronic health records system, which allows medical centers and physicians to share patient files, tests, diagnoses, and treatments. Shaabna thought of the project when she did an internship at a number of hospitals in Palestine, and noticed the lack of coordination between medical centers with regard to patient medical files. For Taweel however, the real win was not claiming the second, or fourth, or even first spot. It was the networking opportunities that the teams enjoyed during their time at the competition. Taweel noted that the project is not only intended to increase cooperation with international academics and experts, but with students from other faculties and majors at Birzeit University.